Stable temperature and humidity is often an essential factor to avoid costly and irreparable damage to property and possessions. The critical alerts from a remote temperature sensor will allow you to take preventive measures before the temperature or humidity reaches destructive levels. The devices can connect to either a WiFi network, Bluetooth or a cellular network to achieve the remote capabilities that enable you to monitor the conditions from anywhere at any time and receive alerts on your smartphone, computer or tablet. Remote temperature monitors are traditionally bulky and expensive devices with excessive monthly subscription fees. Companies immediately realized how vital the monitors are for a lot of business owners so as a result they became overpriced and out of reach to household consumers. Fortunately, one company in particular, is placing the technology in the hands of all customers by manufacturing a WiFi thermometer that is simple, reliable and affordable with zero subscription fees. After extensive testing and research, we have concluded that the Temp Stick WiFi Temperature & Humidity Sensor From Ideal Sciences (click here to check the price on TempStick.com) is the best device overall. The Temp Stick WiFi thermometer is the easiest to set up; it’s accurate, and it offers the ideal combination of functionality and affordability in a discreet and compact battery operated unit. How Are You Going to Use the Remote Temperature Sensor? We’ve taken a look at the best remote temperature sensors, and after testing the top models and reading a number of user reviews, we have uncovered one standout winner. Here are our findings. It doesn't matter whether you’re monitoring a freezer room, vacation home, RV, greenhouse, or a beloved pet, the Temp Stick is by far the best remote temperature sensor for the job. Made in the USA and built to work in Canada as well, the compact and reliable WiFi thermometer is powered by 2 AA batteries, which will give you approximately 12 months of life depending on how often you configure the sensor to take readings. We recommend installing lithium batteries for better longevity and performance in extreme conditions (i.e., fridges and freezers). 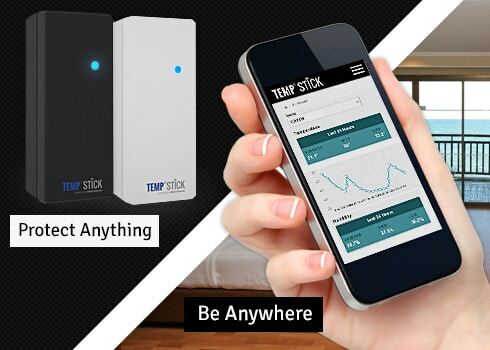 The Temp Stick is an internet thermometer that uses a WiFi connection instead of Bluetooth or a cellular network for remote monitoring and alerts. Plus, there are no additional gateway devices you will have to purchase for the connectivity—it’s all built into the device. A WiFi temperature sensor is the most versatile option to be able to monitor the conditions from just about anywhere 24/7. A cellular device typically incurs extra costs and the operating range on a Bluetooth device limits the amount of applications the sensor can be used for. If you’re traveling with the device in an RV or if you're just in a position where you don’t have access to an internet connection, you can create a mobile hotspot with a Verizon Jetpack to remain connected. We found that the WiFi thermometer was extraordinarily easy to set up and get connected. It's advertised to have a 3 minute setup time and from our experience it felt even quicker. The device is factory calibrated, but if for some reason you’re not happy with the readings you’ll have the ability to set a calibration like synchronization with other instruments by increasing or decreasing the calibration offset value. The Temp Stick WiFi thermometer comes with an intuitive app for both iPhone and Android mobiles. The app allows you to monitor current conditions as well as view an unlimited history of archived data from any date range. If you’d prefer to use a computer to monitor conditions, a web-based version of the app is also available. In particular, we like the graphs that give you a great snapshot of the temperature and humidity readings as you log in. Within the app, you can easily set up triggers to have the device alert you by text or email the instant an important change to the temperature or humidity occurs. You can also have a total of ten different contacts receive alerts and notifications under one account. Additionally, you can customize which contacts receive specific alerts. The platform allows you to add an unlimited amount of devices so you can monitor multiple locations simultaneously with one account, making it useful for more complex situations. You can adjust how often the Temp Stick takes readings, from every 60, 30, 15, 10 or 5 minutes based on your settings. Unfortunately, as 5 minutes is the shortest interval it is not a true real-time reading, so we have to point out that this may be the device’s only negative point. For most users, a 5-minute interval should be adequate. Keep in mind that the first two initial readings are always 1 hour apart based on the default settings when the unit is first activated. After the second reading, the device should update in line with your settings. Other noteworthy features include alerts for battery levels and loss of connection. That’s extremely important because losing connectivity without warning could spell trouble. If the Temp Stick misses a check-in for a reading because the power is out or the internet is down the system sends you a notification that your sensor missed a check-in because it could not find a WiFi connection. The sensor will continue to log data (up to 100 readings) until it can connect again. You’ll receive a notification when a link has been re-established. You can also trust that your readings are accurate and reliable; designed to work in commercial freezers the Temp Stick WiFi enabled thermometer is one of the most accurate and robust sensors out of the box. It has a temperature range of -40°F to 125°F accurate to ±0.4°C (max) and a relative humidity range of 0 to 100% accurate to ±4% RH (max). The Temp Stick does not require a subscription so there are no recurring hidden fees. You only have to pay for the device, and that’s it. The sensor is one of the more expensive options on our list, but again we’ll point to the built-in WiFi, the reliability, and the high-degree of accuracy as key reasons to look past how much you might be spending. The Temp Stick from Ideal Sciences is a trustworthy WiFi temperature sensor that will get the job done without any hassle. It's accurate, reliable and user-friendly. When you're monitoring expensive, temperature sensitive equipment, we understand that you must have an accurate monitor that will deliver alerts without fail. We quickly discovered that the Temp Stick is that device. We couldn't find a better option on the market. No true real-time reporting. The shortest interval for readings is 5 minutes. The SensorPush Wireless Thermometer ﻿&﻿ Hygrometer is an appealing option if you’re monitoring rooms or possessions that are within your house. The SensorPush boasts a 325 feet connection range with a clear line of sight through Bluetooth, although, most of the time there will be obstructions between you and the sensor causing the range to be restricted. There is a WiFi gateway device that can be purchased to connect to the internet which will improve the remote capabilities, but it’s expensive and adding an extra piece of equipment takes away from the compact and convenient nature of the device. For this reason, we prefer the Temp Stick instead. Otherwise, the SensorPush is a very capable wireless thermometer and hygrometer. The device measures just 1.57" x 1.57" x 0.65" and weighs only 40g making it the smallest remote temperature sensor on our list. Despite its small size, the sensor is accurate, constructed with a Swiss-made sensing component you’ll always get reliable measurements. The SensorPush runs on a CR2477 coin cell battery which typically provides over a year of regular use depending on the temperature conditions the sensor is placed in. It should last longer in warmer conditions and less in extreme cold. The remote temperature sensor takes readings every minute and can store data for 20 days on board inside the unit itself—which is handy if it loses a connection as the data will be pushed to your phone when you return and reconnect. The intuitive iPhone and Android app can store an unlimited amount of data which is conveniently displayed inside timestamped graphs, and you’ll also have the ability to export all of the data into a CSV file for Excel. Like the Temp Stick the app is easy to use and can accommodate an unlimited amount of sensors, and one sensor can be monitored by an unlimited amount of mobiles. The app offers similar alert and calibration features, and users report that both setup and operation is for the most part trouble-free. Hopefully, in future models, SensorPush can combine WiFi into the device so you don’t have to purchase it separately, as it would undoubtedly make it a more level competitor with the Temp Stick. That said, it would probably be more expensive too, so for those that don’t need a WiFi enabled thermometer and can stay nearby the sensor then the SensorPush is a worthy option. Ambient Weather’s WS-10-X4 Wireless Thermo-Hygrometer setup caught our eye for its capability to monitor up to eight sensors at the same time. This makes it an excellent option for those who need an inexpensive way to monitor conditions in multiple locations at home. The included display console has an indoor thermo-hygrometer sensor inside and it comes with four remote sensors which also have a display for temperature and humidity readings. The console allows you to set alerts when temperature and humidity readings meet certain thresholds, which display both visually and audibly through the unit. You’ll also have the ability to view maximum and minimum readings for each connected sensor. However, for the low cost, you’ll be missing many features that are available on the top temperature monitoring devices. The WS-10-X4 uses a wireless signal (433MHz), so there is a limited transmission range between the sensors and the display console (300 feet line of sight or 100 feet under most conditions). There is also no capability to store readings, and there is no companion app or web-based method to view the data. 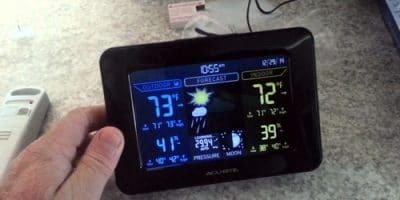 The Ambient Weather WS-10-X4 monitor is an affordable option for users who only need to monitor conditions at home. The remote monitoring capabilities are just not up to the same standard of a wireless internet thermometer, and the lack of a smartphone app makes other options more attractive. If you don’t have access to an internet connection and you need to monitor the conditions from anywhere, then the MarCELL 500 cellular monitoring system may be your answer. Yes, in this buying guide we recommend you stay away from subscription-based units. However, at the same time, not everybody is going to be served well by a WiFi thermometer or a traditional wireless temperature sensor with only short-range connectivity. The MarCELL unit is not just intended to monitor temperature and humidity. MarCELL also has the capability to connect wireless water sensors to the system which they call SPucks. One SPuck is included and you can add up to sixteen in total. They can monitor for water leaks in areas such as your bathrooms, laundry or basement. A traditional wall outlet powers the unit and the MarCELL will also notify you of any power outages. If it does lose power, it can last approximately 30 hours with the backup lithium battery. As long as the location has some cell service, MarCELL will work effectively. If the temperature or humidity exceeds your guidelines you’ll receive a phone call, email or text message depending on your settings. The company also has an online web-based portal where you can view current data and trends, much like the other models we reviewed. The biggest drawback is the connectivity costs. While you can pay a lower effective monthly fee by paying for the service a year in advance, it’s still pretty pricey. We only recommend the MarCELL for situations where traditional methods for remote monitoring either aren’t feasible or are unavailable. The EliTech RCW-800 is a WiFi temperature monitor that comes with a sleek display console making it an ideal remote temperature sensor for commercial businesses that are specifically in need of cold chain storage monitoring. The device is powered by an AC outlet through an included DC adapter and will last an additional 6 hours if the power supply is disconnected thanks to the 3.7V lithium battery. It connects seamlessly to your WiFi network to upload all the data to the Elitech cloud platform. You can view the data remotely via a smartphone or computer. Even when the RCW-800 is disconnected from the network, the device can store data until it reconnects, and it will upload any logged data to the cloud once it does. Data can be uploaded from every 1 minute all the way to 24-hour intervals. Temperature and humidity alerts include an LED indicator, buzzer and platform reminder. The wide temperature range and the high degree of accuracy are commendable, and there are no subscription fees here making the Elitech RCW-800 an attractive solution. Unfortunately, the lack of portability will limit the number of applications that it can be used for. The Room Alert 3E has one primary application: monitoring temperatures in server rooms and IT facilities (it isn’t practical for much else, though). It only requires an Ethernet connection to power itself and monitor temperature and humidity conditions, although if your network is not PoE, just use the included power adapter and you are good to go. The Room Alert 3E uses a web-based interface for viewing data from the sensor, and there is also a local software solution that can be used as an alternative. Alerts are available by email, email-to-SMS, SNMP, web page update and there are more options for alerting via text, voice or GSM (satellite) modem. If you don’t have a computer or server room to monitor however, the Room Alert 3E isn’t for you. All of the functionality is centered around IT users rather than the everyday person. This means that both setup and use of the Room Alert 3E is not going to be as user-friendly as other options. This remote thermometer allows users to connect their sensors to an internet gateway which needs to be connected to a router to observe the temperature and humidity remotely. However, text and email alerts, are a “premium” feature. While you get the first three months free, you’ll have to pay a subscription fee after that to continue the service. Even though initially the La Crosse Alerts Mobile 926-25101-GP is considerably less expensive than other options, we still can’t see much value here as many users have experienced significant setup and reliability issues and the subscription fees are a big negative. The La Crosse remote temperature sensor is also nowhere near as accurate as the rest of our top suggestions, and the technology is outdated, so if precise measurements are what you’re after, look at the Temp Stick instead. There are some important factors that you need to think about in order to purchase the best remote temperature monitoring system for your particular needs. In the guide below we will help you understand what a wireless thermometer or remote temperature sensor can be used for and we analyze the key features that will help you make the best purchase. Use in the home is likely to be the most common reason you’d want a remote temperature monitoring system. You can use it as a home heat monitor to observe an infant’s room to make sure it’s neither too hot nor cold, monitor the basement to prevent damage caused by frozen pipes and monitor the attic to avoid moisture and heat buildup. If you're also interested in monitoring conditions such as rainfall, wind speed and barometric pressure at home, then you will be better served by a complete home weather station rather than just a single wireless temperature sensor. WiFi temperature monitors are particularly useful for remote vacation home monitoring during the months that you are not there. Owners who rent out their homes can monitor their property and protect their investment from extreme weather. There are many uses here. We care a lot about our furry (and non-furry) friends, and many of them are much more sensitive to changes in temperature than we are. Make sure your pet is safe and healthy by watching the temperature and setting a temperature alarm when you have to leave them on their own. Many users find that a wireless temperature monitoring device is particularly useful when traveling with pets in their RV. If they have to quickly step out and leave their dog or cat behind in the RV, they can feel comfortable knowing their beloved pets are safe with the help of a WiFi remote temperature sensor. Click here to see our reviews of the best pet temperature monitors for RVs. Fridges, freezers and walk-in coolers must maintain a cold temperature level that will ensure food stays fresh and safe to consume. A refrigerator and freezer WiFi thermometer alert device is useful not only in your own home to preserve your food but it is a critical instrument for restaurant owners to follow safe food storage practices on their premises. Much like your home, your mobile home or RV could benefit from a remote temperature monitoring system to save on cooling and heating costs and to protect any temperature sensitive goods. It's particularly important to monitor the temperature of your RV during the summer, as just like a car it can heat up very quickly—causing early wear to your interior components and any supplies inside. Vaccines and other medical products must be stored at clearly defined temperatures. Most medical refrigerators have temperature controls but what happens when they fail or lose power? It's essential to have a backup temperature monitoring device to monitor your vaccines around the clock as they can be damaged or lose potency if they're exposed to extreme climates for extended periods of time. Ever wonder why computer rooms in many places always seem colder than the rest of the building? There’s a good reason for that. Experts recommend maintaining a temperature of between 68 and 71 degrees Fahrenheit for optimal performance to avoid any damage to components. Servers must continuously be kept online as they are mission-critical pieces of equipment for a lot of companies in this digital age. Severe data loss and expensive damage to hardware can occur from server rooms overheating; use a remote temperature monitoring system to ensure your data and hardware is protected. Wine, like any other alcohol, is susceptible to temperature changes. The ideal temperature does vary a bit based on the type of wine, but typically a 55°F temperature and 60%-70% relative humidity is perfect for a wine cellar to maintain the integrity of the wine and the corks. You’ll be able to ensure maximum freshness by using a WiFi temperature sensor to monitor the conditions in your wine cellar. Cigar enthusiasts don’t want their prized possessions drying out, so continuously observing humidity levels is necessary to keep them fresh and full of flavor and aroma. Here, a hygrometer is vital for doing just that. Cigars need to be kept at a temperature of 70 degrees Fahrenheit and within a stable relative humidity range of 68%-72%. Chickens and other hatched animals require a specific amount of heat to develop and hatch correctly. It’s critical to watch the temperature and humidity of your incubator to maximize hatch rates. Want your plants to do their best? Make sure they’re getting the heat and moisture they need with a greenhouse thermometer. Now you’ll easily be able to monitor conditions inside your greenhouse with a remote WiFi temperature sensor. Although you may not think of it, temperature and humidity can have an adverse effect on musical instruments, especially those made of wood. If the relative humidity is too low, the wood on your guitar can shrink and crack. Too much moisture in the air can cause the wood to expand and swell, negatively affecting the sound of the instrument. Experts recommend that guitars be kept at a humidity level of 40-50% and at a temperature of around 72°F. With these conditions, your guitar will sound and play its best. Protect your instrument and save yourself from the expensive repairs by merely placing a WiFi remote temperature sensor in your instrument’s case and setting a temperature and humidity alert. The accuracy and consistency of the readings are going to be the most critical feature to look for in every remote temperature and humidity monitor to successfully safeguard your items or protect your temperature sensitive creatures. Look for a device that has a wide operating range for its temperature and humidity readings with a high degree of accuracy. The Temp Stick is an excellent model to compare others too; we’ve found that the Temp Stick is the most accurate WiFi temperature monitoring system. It has a temperature range of -40°F to 125°F accurate to ±0.4°C (max) and a relative humidity range of 0 to 100% accurate to ±4% RH (max). Any sensor you choose should have similar specifications, or better. Having some way to calibrate these readings is also essential. 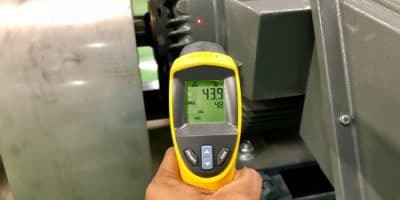 While wireless temperature monitoring devices like the Temp Stick come factory calibrated, there may be times where the readings may slightly drift one way or the other throwing off your accuracy. A useful feature of the Temp Stick is the ability to set a calibration like synchronization with other instruments by increasing or decreasing the calibration offset value. What type of connectivity option you choose will vary based on your specific needs. If you need to monitor a faraway location, then cellular connectivity might be your only choice. Monitoring close to your home will make a radio-based wireless (433MHz) or Bluetooth device viable, while sensors within your server room could use an Ethernet connection. We found that a WiFi thermometer is the most versatile and reliable option to be able to monitor the conditions from just about anywhere at any time. A cellular device normally incurs extra costs and the operating range on Bluetooth and radio-based wireless devices are severely reduced to 33 feet or so when there is no clear line of sight between you and the remote thermometer. 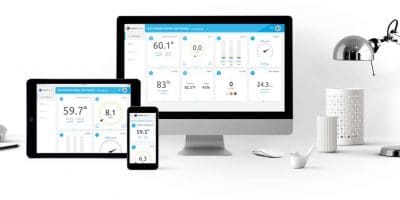 A WiFi temperature monitor is the best device for most applications because you don't have to be near the sensor to observe the conditions and receive alerts. If you’re in a position where you don’t have access to the internet, you can use a mobile hotspot device, such as a Verizon Jetpack, to remain connected. Make sure any remote temperature alarm system you choose has a user-friendly interface. Access from a smartphone or tablet through an app is certainly preferable, but at a minimum, you should at least be able to view an application on a website. Again, the Temp Stick shines here, as its remote temperature monitoring iPhone and Android app allow for easy access to current data and an unlimited history of archived data. The app also offers the capability to change settings and effortlessly create and receive alerts based on your own custom triggers. Some models can support additional sensors that operate on the same platform so you can monitor multiple remote locations at any given time. With the Temp Stick, you can control and receive alerts from an unlimited amount of sensors under one account. 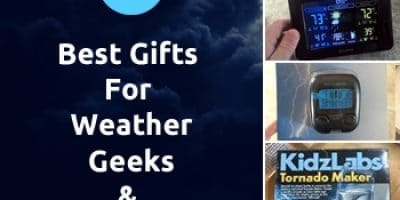 This article is a temperature and humidity sensor buying guide, so naturally, any recommendations we make to you will all be able to do just that. However, there are devices on the market such as the MarCELL 500 Cellular monitoring system that has the option to include a water sensor which can come in handy to help monitor the basement and laundry for water leaks inside your home. Remote temperature sensors will operate from one of a few different power sources, with most operating on battery power. Just remember that the power source will affect how portable they are and your choice depends on your requirements. We recommend selecting a WiFi temperature sensor that is battery powered as it offers the most portability. The Temp Stick WiFi thermometer operates with 2 AA batteries and a typical battery life of 6-12 months is what you can expect depending on the settings. Make sure you use lithium batteries as they perform better in extreme climates and they last longer than alkaline batteries. Other models may operate off of AC power, USB, or through PoE (Power over Ethernet). Typically, the more accurate, reliable, and feature-rich the sensor is—the more expensive it will be. However, at the same time, we don’t see the need to purchase any sensor with subscription fees, unless you genuinely need it. The only situation where we see that happening is when cellular connectivity is required. Beware of these hidden costs. 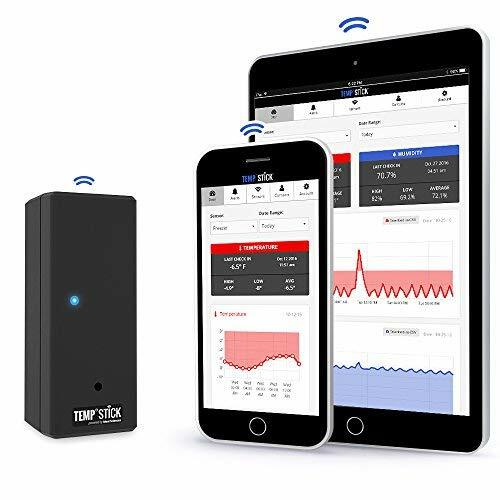 While our top choice, the Temp Stick WiFi temperature sensor, isn’t the cheapest initially, it has zero subscription fees, and the WiFi connectivity makes it useful in just about every possible scenario as you’ll have the ability to monitor the conditions from almost anywhere at any time. Which remote temperature monitor you select depends on what you intend to use it for. While a couple of the devices we’ve recommended here are best suited for specific applications, overall we’re particularly impressed with the versatility and performance of the Temp Stick WiFi Temperature & Humidity Sensor. It’s the most accurate sensor, it’s reliable, the smartphone app works seamlessly, and the inclusion of WiFi connectivity with zero subscription fees propels the remote temperature sensor into a class of its own. Owners seem to have the most long-term success with this WiFi thermometer, so we recommend it here without any reservations. The next best option is the SensorPush Wireless Thermometer & Hygrometer. While it does require a WiFi Gateway to be able to view data remotely over the internet, its performance is quite close to that of the Temp Stick, and if you just need a temperature and humidity monitor for use within your home, then the SensorPush will do an excellent job. Save your property and possessions from expensive and irreparable damage with a remote wireless thermometer. The critical alerts from a remote temperature monitor will allow you to take corrective measures before the temperature or humidity hits destructive levels. After reviewing the top models on the market, we found that a battery operated WiFi thermometer is the standout best option. Our recommendation is the Temp Stick WiFi temperature sensor. It’s accurate, reliable, user-friendly and extremely portable.